In accordance with families wishes a private family service will take place on Friday, September 7, 2018. 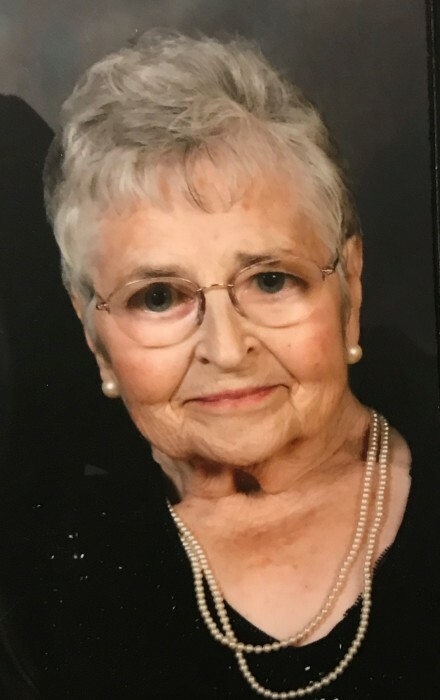 Marion passed away in her Bayside home, September 2, 2018 at the age of 85 years. Marion Elizabeth Rankin was born October 27, 1932, the third child of five born to Jack and Jessie Rankin. Growing up on a busy cattle and grain farm presented ample opportunities to be outside. Either playing, helping with "chores", or visiting close by cousins on the Rankin farms with their Registered Hereford cattle, which would later become an important part of her own life. She attended Lyonshall District school and later Killarney High School, working after school at Ober's grocery store before her marriage. She had caught the eye of a young veteran, Alva Jones, who was working at her Uncle Dave's farm. Alva, it has been told, was impressed at how she could handle a team of horses and so the romance blossomed. They were married in 1952, farming in the Enterprise area before moving to help and later take over the farm when Jack and Jessie retired to Killarney. A busy farm life with five active children, a big house, gardens, school activities, cattle fairs, 4H rally days and numerous community events. Unfortunately, in 1969 at the age of 37 years, Marion was diagnosed with Rheumatoid Arthritis, an autoimmune disease, a chronic progressive, debilitating disease. It soon became apparent that living in a large two storey farm house would be too difficult and Alva and Marion moved to Killarney in 1973. Over her lifetime she endured multiple surgeries with the ensuing rehabilitation and physiotherapy commitments. Even as her arthritis made her life increasingly difficult, she was still able to find enjoyment with getting together with her bridge group, seeing her coffee friends frequently, hosting tupperware and jewellery parties, attending community events and numerous family functions. -The joy Grandma felt holding her new twin great grandsons, not wanting to let them go, even if she wasn't exactly sure how she was going to feed them. - How soft her crippled hands were, her big blue eyes and her kind loving soul. - Everyone remembered the always present and full peppermint candy dish on the coffee table. - I'm going to miss Grandma's quick wit in the room and will always think of her and Grandpa on the front step saying, "Come again soon"
Marion is survived by her children; Margaret (Daryl) Hill, Clare Jones, Donna (Jeff) Cuvelier, Craig (Lizanne) Jones, daughter in law Carol Jones, her 12 Grandchildren, 6 Great Grandchildren, her sister Eleanor Birrell, sisters in law, brother in law, and many nieces and nephews. She was predeceased by her eldest son Calvin, two brothers and one sister, and numerous brothers in law and sisters in law. Not only will Marion be missed but remembered by all who knew her for her amazing strength and perseverance living with her Rheumatoid Arthritis. Always a smile and such a positive attitude in spite of her disabling disease. A true source of strength and inspiration.